I should have written up the article right after the interview. I intended to. It’s all the European Commission’s fault. I got bogged down in completing the final report for an EU project I participated in last year. I did just fine explaining what I did in the project. But then came the financial report, which involved engaging the vast bureaucracy of my sponsoring institution. Do you calculate the exchange rate on the day of the transaction, or the first day following the closing date of the reporting period? I was only on the institution’s payroll for one year of the project, and it was an 18-month stint. Should the freelance chunk go under “personnel” or “other”? Everything had to wait until the drone person in the financial services office could get me the account particulars. Then I found out that I had neglected to subtract the VAT in the mid-term financial report I had submitted last July. Nobody told me about that! Now my final figures are screwed up! Should I take them into account retroactively, on this period’s expenses? Would that be “Other?” And how was I going to get that unrelated translation payment out of the report? In the days before my trip, I made multiple forays over to campus to hold powwows with the secretary in my former office and the woman in charge of EU grants who claims to understand the reporting rules. The night before I left I stayed up past midnight calculating the numbers two different ways since I still didn’t have an answer to the “personnel” versus “other” question. Okay, so that’s not likely. Yesterday I searched the house from top to bottom. I checked the aforementioned suitcase. I looked in what passes for my briefcase, after I found that stashed in a drawer in the study. I looked in my violin case, in the event that I had piggybacked the interview on my improv class. No luck. I searched the recycling, in case Marc had tossed it, although that would have been entirely out of character for someone who has a reputation for managing his life using scraps of paper taped to the wall. See, while I was gone, Brendan’s class took a trip to Edinburgh. Now Brendan is a very bright young man, but organization has never been his strong point. Teachers love to bring this up in parent-teacher conferences. I’ve always blamed it on his father’s genetic contribution. Once in fourth grade he got all the way to school before he realized he’d forgotten his backpack. Last summer, he forgot to take his passport out of the back pocket of his jeans when he got to my mom’s house, and it went through the washing machine. “How long between when you left the room and when you asked at the desk about it?” I interrogate. Life lesson number, um, 1,000? Don’t leave your iPod in the hotel room. Where was he all those times we were on hands and knees checking under hotel room beds just to make sure we hadn’t forgotten anything? “Well everyone was up so late the night before.” His 1:30 am return from the pubs was exemplary, he tells me, in comparison with some of his classmates who didn’t get back until four o’clock in the morning. He assures me that although it was technically against the rules, the teacher accompanying them practically shooed them out the door. “I am not the only one losing things!” he retorts. “I never lose anything,” I answer. No, he hasn’t. And I know it’s true because he’s a terrible liar. What am I going to do? I’ve never lost my notes before. I’m going to have to go on memory. I’ll have to write the scientist and ask for a copy of his paper, purportedly just to check some facts, and then actually try to decipher it. I’m kicking myself, though, because I distinctly remember writing down some good quotes. Now I’ll have to get him to provide them once the article is written. Shoddy. It’s not like I’m writing for the New York Times, but I still like to do a good job. This entry was posted in Family, Humor, Science, Switzerland, Writing and tagged deepwater horizon, teenagers by gydle. Bookmark the permalink. 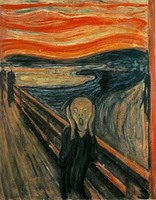 The voice in the painting of the scream is shouting for Ellen. I can HEAR it!